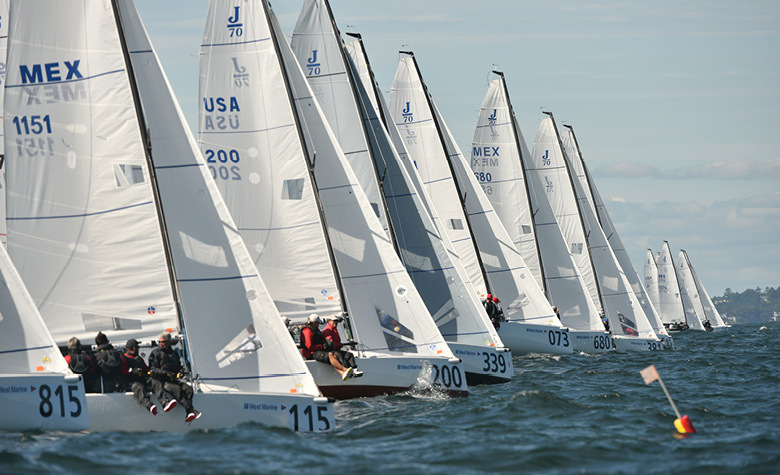 Ninety-one teams from 18 different countries competed in the 2018 West Marine J/70 World Championship, hosted by Eastern Yacht Club in Marblehead, MA September 22 – 29. The depth of talent in the fleet was unprecedented, with Olympic gold medalists, America’s Cup winners and world champions duking it out in 11 fiercely competitive races. Jack Franco’s 3 Ball JT (Kemah, TX) was third overall, just three points away from glory. Delivering the best line at the awards ceremony, Franco quipped, “Jud, if you hadn’t won you would be a dud. But now that you have, well you’re a real stud!” Rounding out the top five were Peter Duncan’s Relative Obscurity (Rye, NY) and Brian Keane’s Savasana (Weston, MA). Teams from Brazil, Great Britain, Italy, Monaco, Spain and the USA all scored race wins. 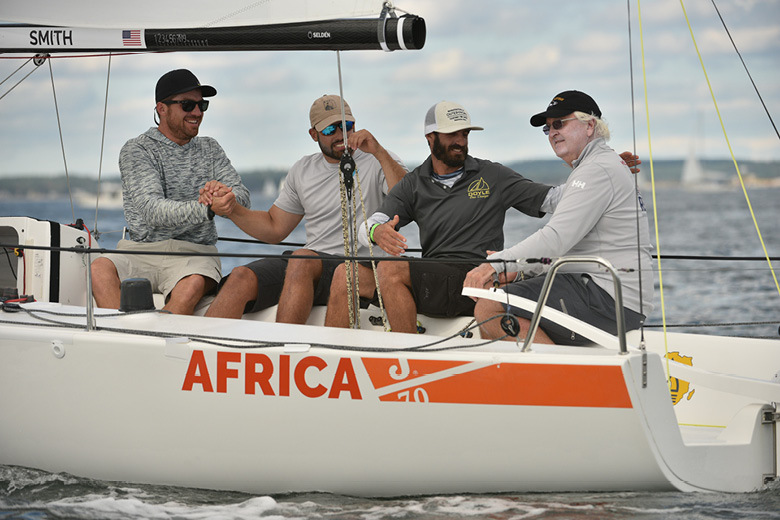 Twenty-two teams made the race podium, epitomizing the strength in depth of the fleet, which was the largest fleet of J/70s ever assembled in North America. Complete results are posted at YachtScoring.com. The 2018 West Marine J/70 World Championship Prize Giving was held at Eastern Yacht Club. Officiating were Regatta Chairman Doug Morgan, Eastern Yacht Club Commodore Ulf Heide, J/70 International Class President Henry Brauer, and Ward Blodgett. Morgan was full of praise for Co-Chair Cheryl Byrne, Principal Race Officer Hank Stuart and his race team, and the Eastern Yacht Club staff, led by General Manager Jeff Wargo and Assistant General Manager Brandon Farrell. Brauer presented Heide with a half model of his J/70 Rascal. 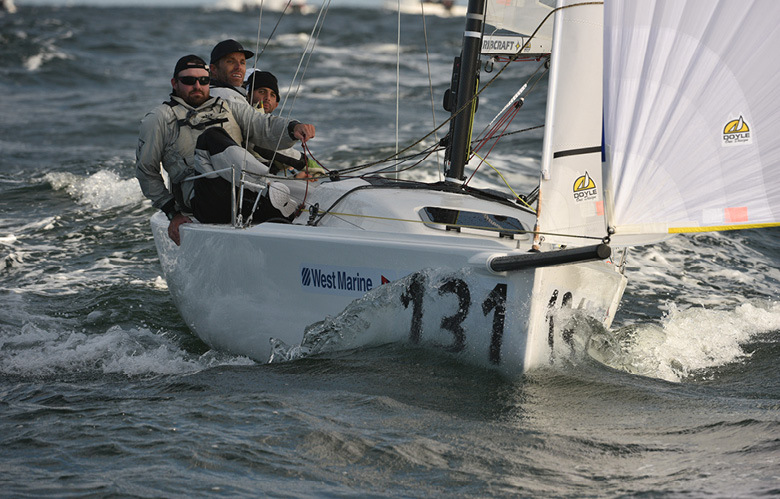 Commodore Heide awarded the prizes to the top ten teams, and special prizes were also awarded: The youngest helm at the championship was Gannon Troutman, whose team sailed Pied Piper (Gloucester, VA) to 16th overall and scored a race win. Claudia Rossi, who steered Petite Terrible (Ancona, ITA) to 12th place, was recognized as the top woman helm, and the crew of Kim Gibson’s Seaya (Fredericton, NB) received a prize for their good humor throughout the regatta. Hundreds of competitors partied through the night after an amazing championship. The 2019 J/70 World Championship will be hosted by the Royal Torbay Yacht Club in Torquay, United Kingdom from August 29 to September 6, 2019. For more information, visit J70ica.org. Experiencing the Joy of Sailing…and Giving!